Crowded with hundreds of middle school students, the Ventana Ballroom in Arizona State University’s Memorial Union should have been chaotic, but it wasn’t. The low roar was the sound of excitement, as teams huddled around prototypes of water-related innovations and tinkered with miniature robots made of LEGO bricks. 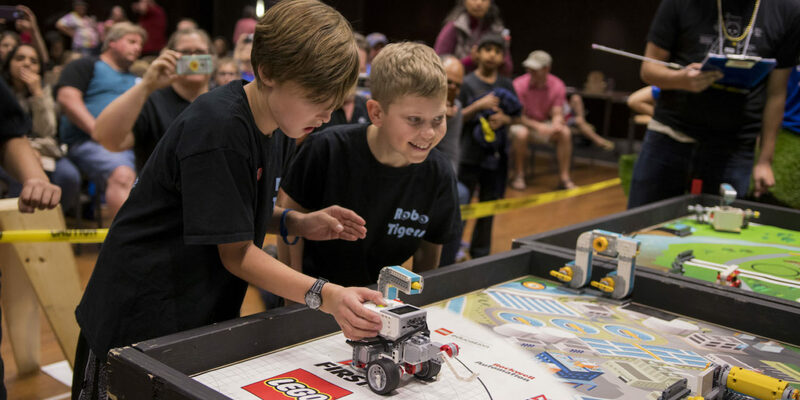 The Arizona FIRST® LEGO® League 2018 state championship was held January 13–14, 2018, with 92 teams and more than 750 kids qualifying. Sponsored by ASU’s Ira A. Fulton Schools of Engineering since 2008, the program exposes children ages 9 to 14 to basic principles of science, technology, engineering and math. The kids work as teams building robots, solving problems and learning teamwork. The Mogollon Mechanics from Heber, Arizona, whose basecamp was in the middle of the ballroom, were busy testing the programming of their robot as they waited for their turn in the obstacle course trials. “It’s really fun, but at the same time it’s scary — this is a real competition,” said fifth-grader Trevor Western, who was competing for the first time this year. Veteran Morgon Martineau, a sixth-grader, was sanguine. 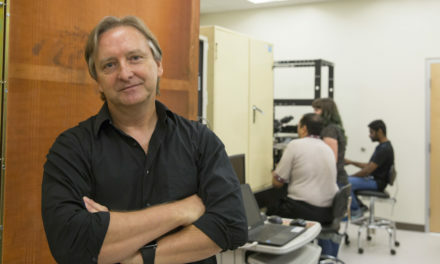 “The best part is having fun while learning,” he said. Jeff Andersen, who coached the Mogollon Mechanics, is a dentist who had no programming experience before getting involved in FLL. He and wife Brooke first learned about the league when their high school daughter went to the world championship of the FIRST® Robotics Competition in St. Louis, Missouri. They saw that there was an opportunity for younger kids to get involved, so last year they decided to coach a team. It was such a good experience that they formed two teams this year, with Brooke coaching the Mechanical Mustangs. And, once the word about the program got out, a third team formed in Heber and another in Show Low, Arizona, and Snowflake, Arizona. Andersen said that small towns like Heber don’t offer many non-sports after-school activities. FLL gives them academic challenges and much more — leadership skills and opportunities to develop character. The robot trials are the kids’ favorite, but the teams are scored on three more criteria. 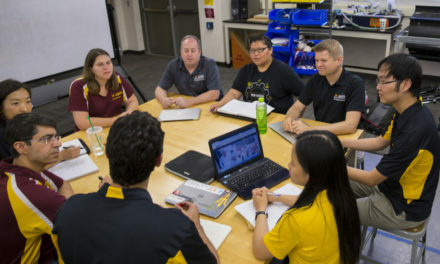 Teams must research a problem connected to the tournament theme — this year it was water — and present their solution to a panel of judges. Next, they must explain to a different panel why they built their robot the way they did. Finally, they must show how they embodied FIRST LEGO League’s Core Values: teamwork, leadership, Gracious Professionalisn® and Coopertition®. Freshman mechanical engineering student Tiger Yang helped judge the robot design presentations. When he was in middle and high school in Scottsdale, Arizona, he was a competitor. He saw how many volunteers it took to run the program and decided to step up himself. And when he works with high school teams, he encourages them to help middle school teams. 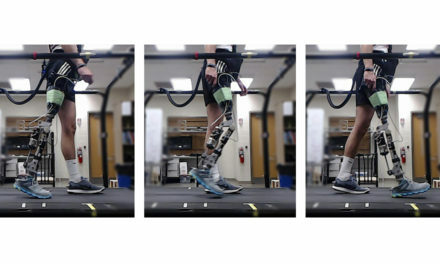 “They experience real-life research and the design process – they touch everything,” he said. “If you can provide a great experience they will want to go on to the higher levels,” and maybe even choose engineering as a career. Evelyn Holguin, an industrial engineering senior, judged at the state tournament this year. One of the benefits of programs like FLL, she says, is that it breaks down misconceptions that math and science are “too hard.” The project portion of the FLL competition, where teams identify a problem then work out a solution, shows girls who might prefer one of the “helping” professions that engineering helps people, too, said Holguin, a New American University Scholar. Environmental engineering doctoral student Anjali Mulchandani went to a lot of science fairs and competitions growing up that were all volunteer-run. “The success I’ve been able to achieve is because of those camp and after-school programs,” she said. This year she shared her water expertise with one of the teams, then judged the state tournament on the day her young friends were not competing. It was especially gratifying to see teams acting out the FLL core values, she said. “One team, who eventually won an award, helped another team fix its code, even though it made them more competitive,” she recalled. Brooke Andersen’s team of Mechanical Mustangs from Heber learned those soft skills well. They won a “Gracious Professional” award, partly because they organized a scrimmage for first-time FLL teams in their area. 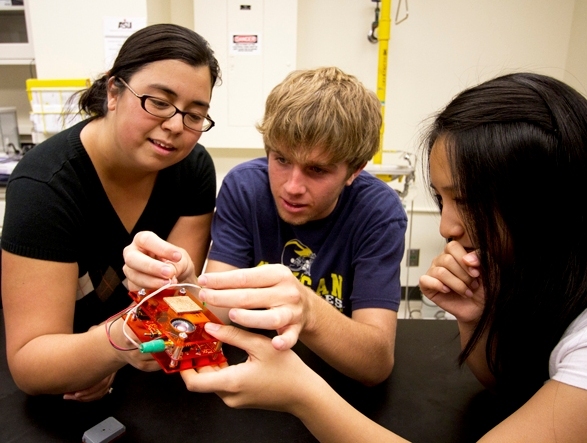 Technical expertise and helping others: the future of engineering is in good hands. Written for Full Circle by Elizabeth Farquhar.